It was only a matter of time before Amazon's offerings would include an in-memory cache service via their amazon webservices (aws) cloud architecture and today is the day! If you're looking for a scalable object caching system, you might want to seriously consider Amazon's ElastiCache. Although it's currently in beta (what isn't these days), it's open for business and ready to handle your caching needs. The documentation is farily robust considering it's 'beta' status. I found their section on choosing cache node type and the number of cache nodes particularly helpful. I was finally able to finish up my MuraMediaPlayer plugin for Mura CMS. This plugin uses JW Player™, the Internet's most popular and flexible media player. It supports playback of any format the Adobe Flash Player can handle (FLV, MP4, MP3 and AAC). It also supports RTMP, HTTP, live streaming, a wide range of settings and more. This plugin is available in the Mura CMS App Store under plugins. Since the primary guts of the plugin are driven by my cfMediaPlayer project hosted on RIAForge (a ColdFusion wrapper of the JW Player™), I'm posting a copy of the license here just so there's no confusion. If you're Mura CMS install is using Amazon S3 for file storage and you've set up an Amazon CloudFront, you can enter the 'Cloud URL.' Otherwise, leave it blank. If you're Mura CMS install is using Amazon S3 for file storage, you have an Amazon CloudFront set up and you've setup a Streaming Distribution to deliver content to end users in real time, you can enter the 'Streaming URL.' Otherwise, leave it blank. Under 'Site Assignments,' select the site(s) you wish to enable the plugin to run on. That's it! You're ready to create MuraMediaPlayer pages and/or use a new [mura] tag method that is now available to you. Please visit Amazon for more information about their S3 and CloudFront services. Detailed instructions for using the plugin are available at http://www.getmura.com/index.cfm/app-store/plugins/muramediaplayer/documentation/. In addition, instructions can be found after you install the plugin simply by logging into the Admin area, click 'Plugins' (or go to 'Site Settings', then select 'Plugins' tab), then click the 'MuraMediaPlayer' link. 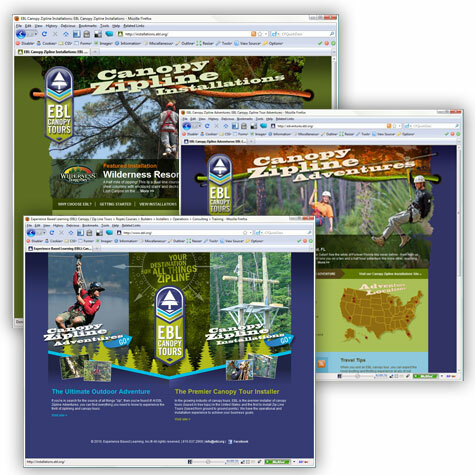 EBL Canopy Tours, launched their completely revamped online presence at www.ebl.org. Technically speaking, three (3) separate sites have been launched for EBL. The main site has become more of a "landing" page allowing visitors to choose the direction they wish to proceed: Canopy Zipline Adventures and Canopy Zipline Installations. The "adventures" site is geared towards those seeking zipline and canopy tour adventures, while the "installations" site is geared towards those seeking the "premier installer of Canopy Zipline Tours." All of the sites are powered by Adobe® ColdFusion® and Microsoft® SQL Server with online content management provided via Mura CMS. Jaci M.'s fully customized designs were easily integrated into Mura CMS to allow our client the ability to add and edit content while maintaining the original design's integrity. The sites feature a brand new Mura plugin I've developed called MuraMediaPlayer™ which will soon be released to the general public. MuraMediaPlayer allows our client to easily add media files to any page on their site. I also set up an Amazon S3 for storage of site assets and Amazon CloudFront account to allow for streaming video. In addition, the adventures and installations sites both feature a "weighted-randomized" header for the home pages. Using some Mura class extensions, I enabled the client to upload a header, location details, up to five (5) additional location images and also determine the "Weight for Randomness" for each canopy zipline tour location. This was definitely a fun project to be a part of and hopefully one of these days, our client will invite us to one of his canopy zipline locations (hint hint!). Congratulations to everyone at EBL, and I look forward to working with you again soon.